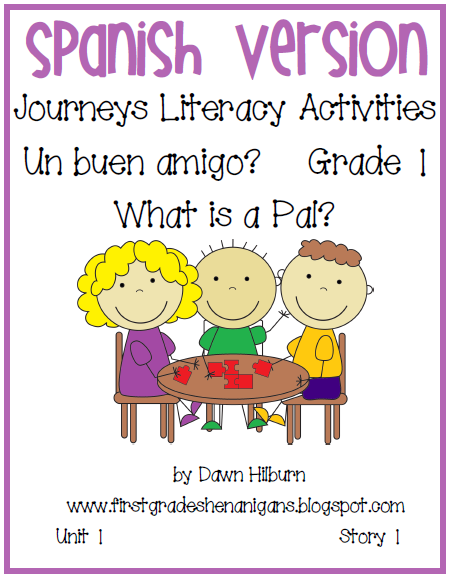 New Journey's reading packs in Spanish - What??????? I have been working to translate my Journey's reading units into Spanish and the first book is nearly done. I have had many requests to do this and finally had the time to do it. (With MUCH help from Melissa Martinez - can't thank her enough!!!) Click on the picture below to check out the first story "What is a Pal?" I also have some news. My first grade team will be team teaching next year. Two teachers will be considered a team. We have 6 teachers in all, so we will have 3 teams. I am teaching the math and science. My team teacher will be teaching ELA and social studies. We will start the day with our home room and then switch and teach each other's home room. It should be interesting. We haven't figured out a schedule nor know exactly how this will work but I will be ready to dive in and figure it all out in August. Hope everyone is having great, restful summer!! !